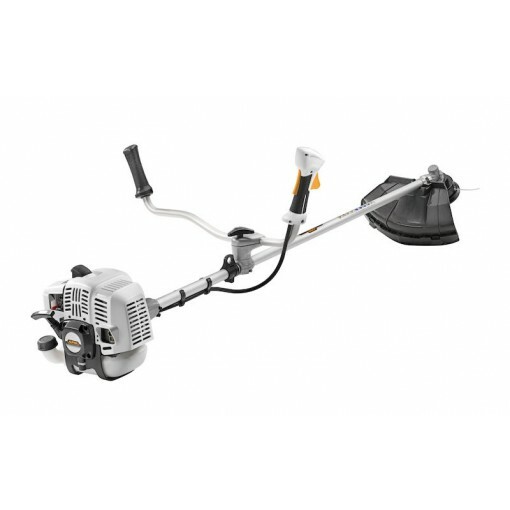 ALPINA PETROL BRUSHCUTTER 32cc B32D: Great performance combined with incredible maneuverability. The Alpina B 32 D brush cutter is perfect to be used in the maintenance of large areas, such as big gardens or parks. Equipped with a 32,6 cc engine, this brushcutter is very easy and comfortable to be used, thanks to the ergonomic bike handle, the perfect global balance and a lower vibration level.The body of the brush cutter has a reinforced structure to absorb impacts, while the nylon head is developed in order to obtain a more silent work. Double harness and a 3T metal blade are supplied together with the Stiga B 32 D brush-cutter. Soft grip handle: Softgrip is a special rubber which protect the handle where it get holded while the machine is in use. Absorbing part of the vibrations while augmenting the grip it makes more comfortable the use of your machine.